DB8 has been ready for several years by now, but I never got around to publish it. Since it's included in the (upcoming) V1.4 update of the GrafX2 Toolbox...why not do it now? We're approaching the limit where it makes sense to deal with hues and ramps across the whole spectrum (= a challenge!). 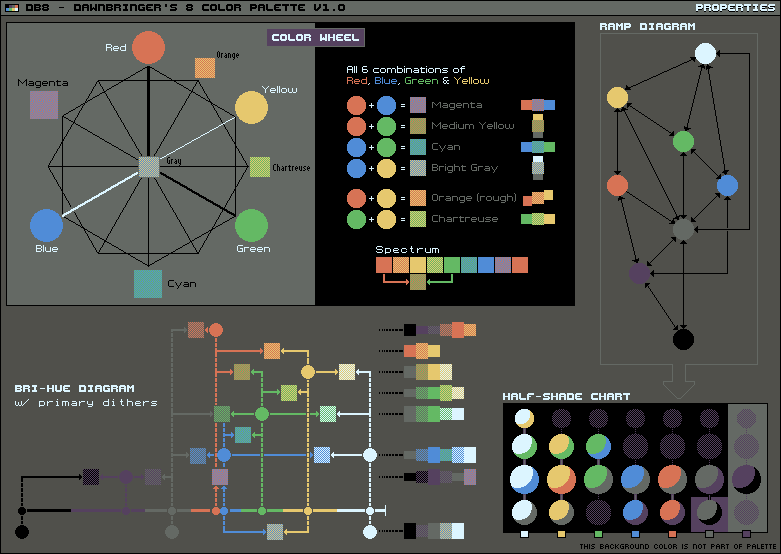 There's so few colors that we can create diagrams and map full sets of combinations that would become too complex with larger palettes. 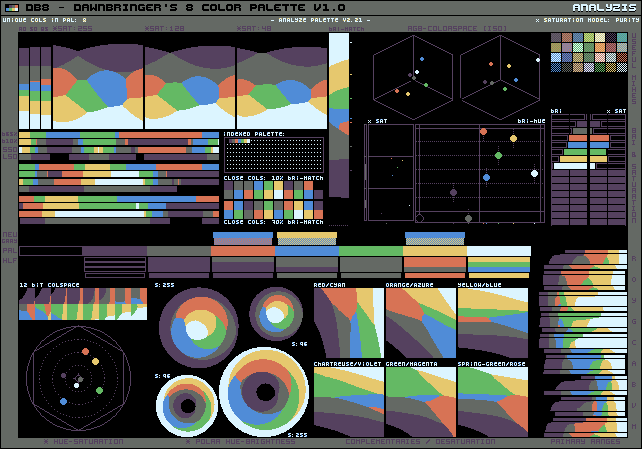 It can serve as an easy to understand example of the fundamentals of palette design. Great work! Although I guess some would miss pink color for human portraits. Wonderful! 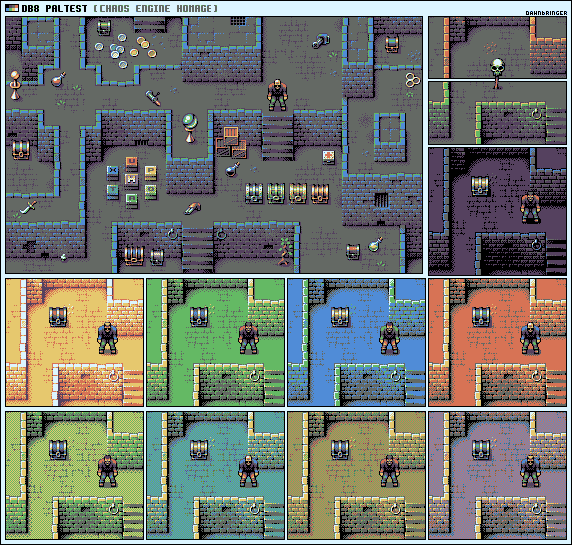 I'm equally impressed by the palette, as by the applications and examples you've given! Also it is interesting, perhaps unsurprising, to see that it has a very similar aesthetic or style as db16 and 32. @snv: DB litterally gave an image with examples of human portraits in 30 different color combinations with this palette! By the way, speaking of the dithering, I hardly noticed the dithering until I zoomed in. Dithering became a bit irrelevant when lcd screens first came out.. but now that resolutions are increasing, will it find back its purpose? What do the exclamation marks on the portraits mean? I quite like the range of skin tones. I'm also impressed by the dithering. Usually I don't like it since I'm a pleb using ancient LCD screens, but the value contrast in the colour pairs here is sufficiently low that it works very well. Oh, they just indicate the primary/best schemes with the most balanced ramps. Try recoloring your avatar using it, you will see that using it is not as easy as using db16. So I won't recommend db8 for newbies. > (dithering) now that resolutions are increasing, will it find back its purpose? Dithering large surfaces is still not recommended because if the image can scrolls freely, the screen pixels take a noticeable time to trasnsform from one color to the other, producing a "swarming" / "glittering" effect, unless you're using a gamer's fast screen, or you make sure to scroll only in coordinates which are multiples of the dither pattern's period (ie: generally 2x2). For example, try opening the following image, and slowly move your browser's window. Thanks for clearing that up, I never knew why dithered pattern scrolling had that effect! Made this quick piece with 6 shades of the DB8. 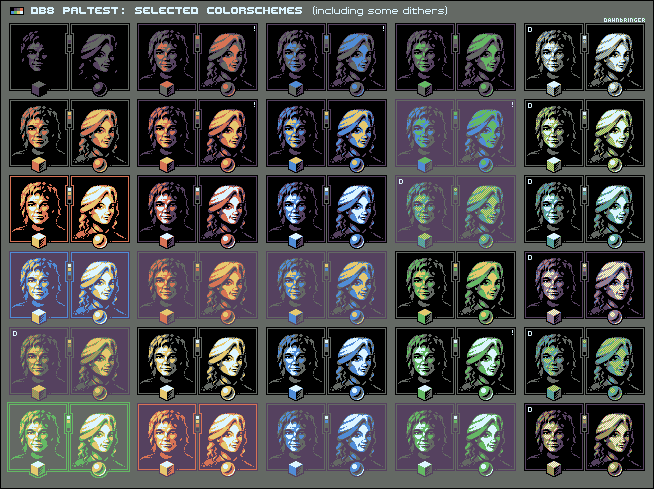 I don't know if there's a way to make more colors out of the existent ones, but it's a pretty nice pallete.